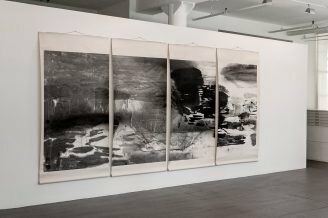 Ink has often figured in many of Zhang Jian-Jun’s works whether creating large installations, photography, or intimate drawings on paper. A constant in Zhang’s work over the past 30 years, ink drawings are a substantial and significant part of his practice. This skill, and Zhang’s referencing of thousands of years of art history from the contemporary moment to the distant past, is visible in the large, boldly painted five panel work Nothingness, Water, Fire, Wind, Earth. ZHANG JIAN-JUN (b. 1955, Shanghai, China) is currently based in Shanghai. Widely exhibited, Zhang has shown extensively in Asia, Europe and the United States. Zhang’s work is represented in major collections including the Uli Sigg Collection, Switzerland; M+, Hong Kong, Frederick R. Weisman Foundation of Art, CA; Djerassi Foundation Permanent Collection, CA; Shanghai Art Museum, Shanghai, China; Shenzhen Art Institute, Shenzhen, China; Guangdong Museum of Art, Guangzhou, China; Yuz Museum, Shanghai, China; White Rabbit Collection, Sydney, Australia; JP Morgan, Hong Kong; and Genentech, CA.